Apple has released Apple TV to the public and now, people in some countries have already had the chance to try out the fourth-generation device Apple TV. So how to better use the new Apple TV? 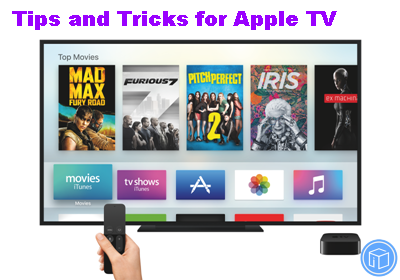 Here, I have collected some tips and tricks to use Apple TV, from MacRumors. - Apple TV can be renamed in Settings under AirPlay > Apple TV Name. - Apple TV network strength is displayed in Settings under General > About. - The new Apple TV can also learn universal remotes in Settings under Remotes and Devices > Learn Remote. Follow the on-screen instructions. - The sensitivity of the Siri Remote's touch surface can be adjusted in the Settings app under Remotes and Devices > Touch Surface Tracking. - The triple-press Home button accessibility shortcut can be changed in the Settings app under General > Accessibility > Accessibility Shortcut. - The Siri Remote's battery level is listed in Settings > Remotes and Devices > Bluetooth. - The Siri Remote can power on/off or adjust the volume of your TV and speakers over HDMI-CEC. In some cases, this pairing process is automatic after setup, or configurable in Settings > Remotes and Devices under the "Turn On Your TV with Your Remote" and "Volume Control" menus. - To rearrange an app, hover over it and hold down the touch surface until the icon starts to jiggle. Then, swipe left, right, up or down to move the app, and press the touch surface once to finish. - The touch surface has accelerated swiping, meaning that a faster swipe results in faster on-screen scrolling. - Hover over any letter on the keyboard and hold down the touch surface to bring up a contextual menu, which includes uppercase letters, accents and a backspace key. - Hover over a song and hold down the touch surface to bring up a contextual menu, which includes various Apple Music options. - Press the Menu button once to go back. - Press the Menu button twice quickly from the Home screen to start the screensaver. - Press and hold the Menu and Home buttons simultaneously to restart the Apple TV. - Press the Home button once to return to the Home screen from anywhere. - Press the Home button twice quickly to bring up the App Switcher, which displays all apps open. Swipe up on the Siri Remote's touch surface to force close an app. - Press the Home button three times quickly to access VoiceOver. - Hold down the Home button to place the Apple TV in Sleep mode. - Hold down the Siri button to use Siri. - Press the Siri button once and wait to view a list of commands you can ask Siri. - Press the Play/Pause button once to change the keyboard between uppercase and lowercase. - Press the Play/Pause button once to delete an app in wiggle mode, which requires hovering over an app and holding down the touch surface until the icon starts to jiggle. - Hold down the Play/Pause button for 5-7 seconds to return to the Apple Music app.